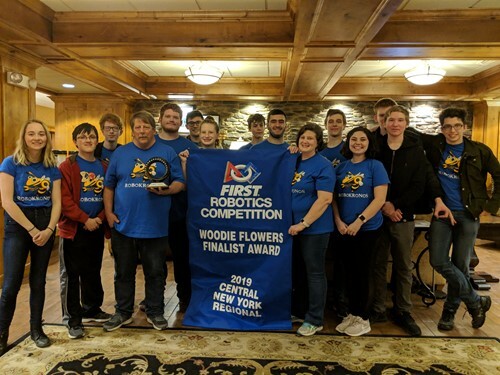 Oneonta High School’s FIRST Robotics Team, RoboKronos, took home top honors at the FIRST Central New York Regional competition, March 14-16. Team member Ryan Mussaw was named a Dean’s List Finalist, which recognizes leadership and dedication among outstanding 10th and 11th grade students. The award is given to a student who demonstrates leadership and commitment, and helps build interest and passion in FIRST, as well as motivating and leading other team members. As a Dean’s List Finalist, Ryan will have the chance to travel to Detroit with other finalists to meet with industry leaders. He will also be able to compete for scholarship money. In addition, team mentor Mr. Copperwheat received the Woodie Flowers Finalist Award, which recognizes effective communication, and communications leadership. Mr. Copperwheat was nominated for the award by students on the team in recognition of his leadership.